In the musical theater version of Camelot Arthur has a moment when he recalls something Merlin said to him when he was younger. Merlin, who has since been bewitched and is no longer available for counsel and guidance, mentioned the “Round Table.” In a bright moment of epiphany, Arthur realizes that he has somehow fulfilled a part of his destiny. Destiny is an elusive thing. Sometimes (perhaps frequently) it is only easy to see in hindsight. Which begs the question as to whether it is destiny, or just what actually happened. I prefer not to think of it as a Calvinistic predetermined destiny. I believe that we are a unique set of abilities and preferences the predispose us for things. But we must decide what we do with what we have been given. What would be an ideal life for one might be hell for another. In my life circle there are artists who can walk into a room, look around, leave, and then remember what everyone was wearing, where they were sitting, and probably what kind of mood they were in. I cannot do this. Not even close. Perhaps you can. I have my own set of uncommon abilities and so do you. But this sort of visual memory escapes me. Some mundane things that others take for granted I can only do with great concentration if at all. But I also have abilities that are unique that set me apart. SO DO YOU! Being an encourager is all about helping everyone we know to become better versions of themselves. This is more challenging that you might think, because the natural inclination is to want everyone to be like us. That is a lot of explaining about individual differences to set up a discussion of something that, at least in the world of the Happy Rock Way, everyone can do to some degree. And once they learn to do it some they can, with intentional effort, do it more and better. There are no tests, evaluations, certifications, or degree programs. Perhaps the best news is that there are no student loans. There will be some soul searching and perhaps even some false starts. Even some personal fails. In this sense, the pursuit of excellence is normal. You can be an encourager. And maybe even a professional. Like King Arthur, I stumbled one day upon an idea. It wasn’t from Merlin. It was from a person I spoke to by chance in a coffee shop. At this point in my life my children were studying piano in a studio on 15th street in Tulsa. One of the lessons was forty five minutes long. I would go to the Utica Square Starbucks, get a cup of brewed coffee, and read a book. I rarely spoke to anyone. Almost never. I was in full introvert mode. On this particular day, however, I had gotten my coffee and was heading to my seat when I saw a woman sitting in the corner. I am not one to see auras, but I had a moment of perception. This woman seemed to be having a bad day. I couldn’t really see a rain cloud over her head, but this sense that something was not going well was strong. There were a lot of good reasons to file that away and go on. She was a lot younger than I was. Some people are comfortable talking to people outside of their age group. (Teachers usually are.) Some are not. And if a person is having a bad day maybe they just want to deal with it. Something in my noggin told me to at least ask after her well-being. “Are you OK?” That seemed safe. “This morning I went to a funeral at 10:00am for my bosses son. Died of a drug overdose. And it has gone downhill from there.” Man. I had no words of wisdom, except for to agree. That was bad. And I am not sure, but I think she was waiting for someone who was late. My new friend’s name was Valerie. I am not clear about everything we discussed in the next few minutes. I think I was actually in a conversational flow state. No, really. When you are in flow, no matter what the activity, individual details sometimes get lost. (Leonard Bernstein claimed he could not remember anything of his debut performance with the New York Philharmonic. So this post is not as socially significant, but flow is flow wherever you experience it.) I asked her what she did. She said she was a singer/songwriter. Part of my brain was skeptical about this. I told it to shut up. She was having a bad enough day without me going into cynical musician mode. So I asked about it. She opened up her laptop and played a song she had written and recorded. And I mean, she had actually written it. As in every note she sang and played on her guitar was written out in musical notation that played back on the screen as I listened to the song. It was obvious that she had some uncommon skills and training. And she could sing. It was a song of raw passion and it showed. I had no trouble being appreciative. The ice was shattered like a nerd’s ego after a prom date rejection. From that point on it seems like we had become instant old friends. We talked of life and what made it important. I told her I did a lot of things but my day job was teaching string orchestra to middle school students. I said that sometimes I didn’t feel like a teacher. I was more of an encourager. It was challenging work. People truly seem to understand that teaching is challenging work. I decided Valerie was right. I took it and ran with it. Since that moment, I have striven to be a Professional Encourager. It turns out that doing it well is challenging. In fact, I am not sure how well I do. I just know that I am always giving it a shot and I am reasonably sure that I am at least better than I was. It is all about being a ray of sunshine. Or, once again, attempting to be a ray of sunshine. I have had some huge fails. It is hard to encourage someone unless you know something about their aspirations. And some people just aren’t ready to discuss this with someone they do not know. It can be easier with people you know some, but that really limits you. I have offered a couple of people a Happy Rock who reacted like I was offering them a wedgie. I just figure that is all about where they are and move on. All this just to say that it is OK to fail. 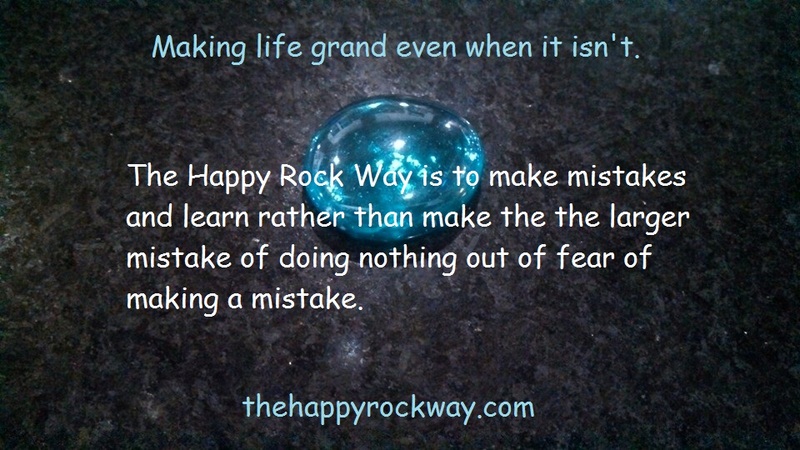 The Happy Rock Way is to make mistakes and learn rather than make the the larger mistake of doing nothing out of fear of making a mistake. Which is a mistake. See? Are there some things you can do to help improve your encouraging skills? Sure. Some are generally good advice, and some are especially good for Professional Encouragers. If you work on them until the become more of a habit, you will find that it gets easier. Your encouraging skills will improve. 1. Be sincere and have faith in people – In his famous book about How to Win Friends and Influence People, Norman Vincent Peale talks about the power of a sincere compliment. Anything less is cheap flattery. If you can personally believe and have faith in someone’s ability to do something with enough work and drive, then tell them so. If someone has a nice smile, mention it. If your artist friend creates something moving and beautiful, whether it is a visual work or a performance, take some time to mention it. If your writer friend writes well, let them know. If a person seems like a light in a dark world, mention it. And tell them why. Much, perhaps most, of my success as a music teacher had to with having faith and believing that students could perform at a high level and keep improving. Oddly, when I was sincerely disappointed in a student’s performance and progress it was uncanny how often I found out that they had a substance abuse issue. However faith and belief in a person works, it doesn’t work as well when chemical dependency is involved. There are other spiritual and mental factors that can derail a person’s growth as well. But keep trying. 2. Pay attention – In the story above I was fortunate enough to notice that something was bothering another human being. People are broadcasting stations for all manner of things if you are paying attention. You do not need to try to consciously analyze what you are getting from the person. Your brain is hard-wired to do this. Sometimes trying to figure it out makes it harder. There is a famous study in which pictures of facial expressions were shown all over the world. It turns out most facial expressions mean the same thing in all cultures all over our world. A smile does not mean sadness anywhere on our planet. So you are not just paying attention to the other person, you are calmly paying attention to what your inner voice is telling you about the other person. Listen! This positively made me a better teacher. It takes some practice. Interpreting your own inner voice can be learned and improved. When I began to get better at this I was horrified to learn that I had been chastising students for lack of interest or poor attitude when they were actually depressed, or sick, or any number of things that can cause a middle school student to withdraw. Instead of yelling at students to sit up and play their instrument right now I would often ask them to come talk to me so I could find out what was wrong. And oh, my, did I find out. Divorce. Drugs. Divorce and drugs. Mental, physical, and even sexual abuse. I heard all of it. But more often it was just allergies or their dog was sick. Amazingly, once the students knew I was concerned for them they were more willing to work with me, even before their problem was solved. 3. Be persistent – In the words of Zig Ziglar, “Anything worth doing well is worth doing poorly.” That is, doing poorly until you learn how to do it well. 4. Have courage – If you are an introvert or not especially interactive, or if this is an idea that is new and different for you, you can still make progress. Learn how to do this in your own way. None of this advice concerns specific techniques. It is mostly about attitudes and personal values. 5. Be sensitive and sensible – This flows from Paying Attention. Suppose someone was to tell me that I dance “really well for a white guy.” It might be, I think, sincere though not accurate. I don’t dance well regardless of the frame of cultural reference. It would not be very encouraging. If the person does not react to some kindness in the manner you expect, then back off and reassess the situation. 6. Accept the emotions of others – If a person is sad, it is OK. I try to avoid saying, “Don’t be sad.” People have emotions for a reason. Accept them. Then maybe you can help them move on from there. It seems like I always have a friend or three going through a rough patch. I may try to cheer them up after I have accepted and affirmed who they are and how they feel. I can get upset at people for doing things. But I try to avoid getting upset at a person for how they feel. They feel how they feel. Now what do we do? Sometimes your acceptance of a person’s feelings will allow them to accept them too. And then, if need be, move on from them. 7. Learn from your mistakes. This is, of course, truly the Happy Rock Way. Fail upward by learning. If you say something nice to someone and they throw it back in you face it is OK to keep trying. But see if you can’t think back and learn from the rejection. Maybe they weren’t ready to be encouraged that day. Figure it out. I am still learning. Lots. There are some things I avoid in my encouraging. I never, never, never tell anyone they are “smart”. Suppose someone is or isn’t smart. There is nothing you can do about “smart”. So that implies that the person is just lucky and telling a person they are lucky may be accurate but it is not encouraging nor is it a compliment. Praising anything that is beyond control can be received poorly. Ask anyone who seems to be intelligent or who makes good grades if they are tired of people telling them they are smart. Telling them they are smart or (no really) talented actually devalues the time, effort, and downright hard work they have done to get good grades or to excel in an art form. In truth, the talent compliment is more likely to be viewed as good, but not always. And the person who hears a compliment based on talent may assume that they do not have talent when they just need to get to work. Here is a link to more information about this. This may help you understand how to more effectively praise or encourage. In the same manner, I am very careful about praising a person’s appearance. Partly because we live in a world where comments on a persons look can easily cross a social line, but also because some people have the perception that beauty is something you have rather than something you earn or do. Sometimes I will actually say, “Would it be appropriate to say that you are really looking great today?” I have never gotten in trouble saying that, so far. But I only do this when there is a high degree of mutual respect and understanding. Here is a thought. For some people, looking good is actually a result of a lot of effort, preparation, and self-discipline. In addition, a lot of what we are predisposed to perceive as beauty is actually about looking healthy. And keeping yourself in good healthy physical condition is not easy for most of us. And knowing how to present yourself is important as well. I am clueless about this but I have good advisers. I am more likely to comment on the look a person has achieved, their use of color, or their fashion statement. In other words, something that they actually did instead of their luck or genetic makeup. But take care to make sure the person knows that it is all about respect. Now, if you are in a relationship it is different. I suspect you know this. You know they are beautiful and you are going to say so. They will love you for saying it even if they don’t agree with you. But still be careful about telling your significant other they are smart. Trust me on this, OK? I reserve the right to revise and extend these points. If you feel like I have left something out or otherwise gone astray feel free to leave a comment. This is too important to leave as is. I would also like to thank Valerie for giving permission to tell the story at the beginning of this piece. Thank you Val! Next Article Be Your Own Kind of Awesome!